The idea of bitcoin as “the new global currency” has long been losing prominence as the primary narrative around the digital currency. These days, you’re more likely to hear about bitcoin as “censorship resistant gold” rather than as a means of payment. 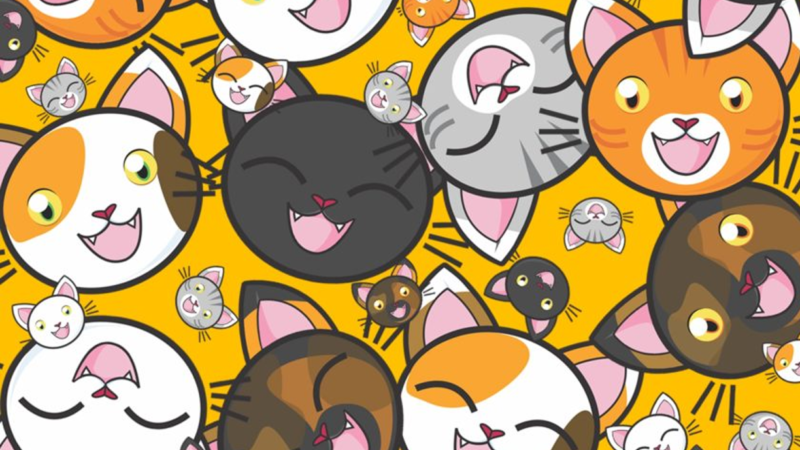 The value of bitcoin payments handled by major processors fell to $96 million in September from a December 2017 high of $427 million, according to the data compiled by Chainalysis. 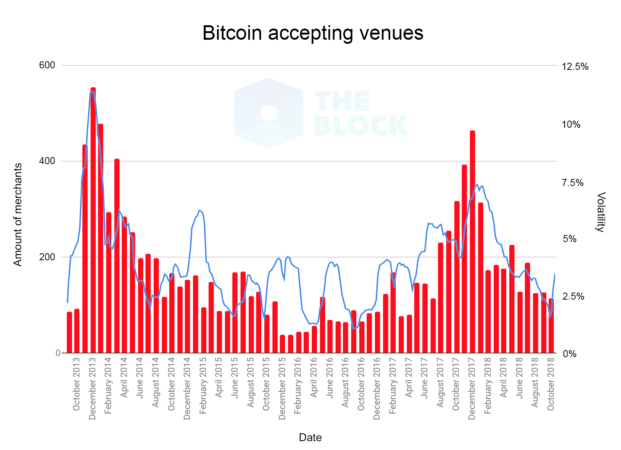 As the blocks filled in December and January, fees to transact in bitcoin increased rapidly. As a result, for some time bitcoin became impractical for payments. 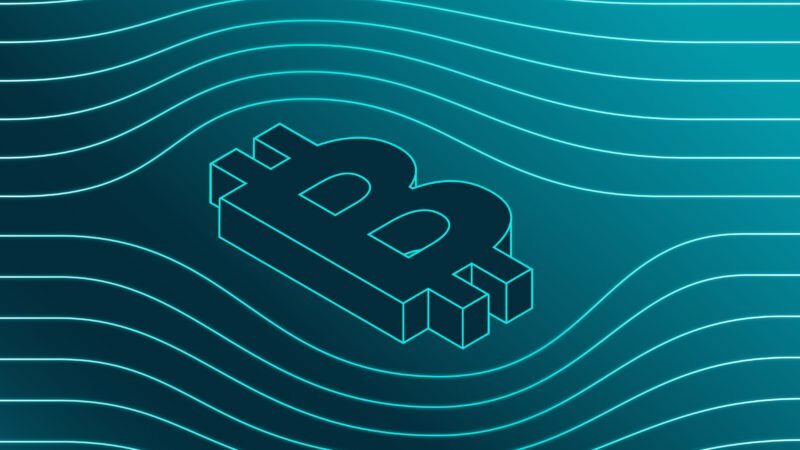 By January, Stripe announced that it was ending support for bitcoin payments, citing high fees and long transaction times. With the emergence of Lightning Network as a payment protocol for bitcoin, however, its use in commerce could increase again. The Block used the data from coinmap.org, which compiles all the ATMs, brick-and-mortar stores, services, restaurants and other venues accepting bitcoin. 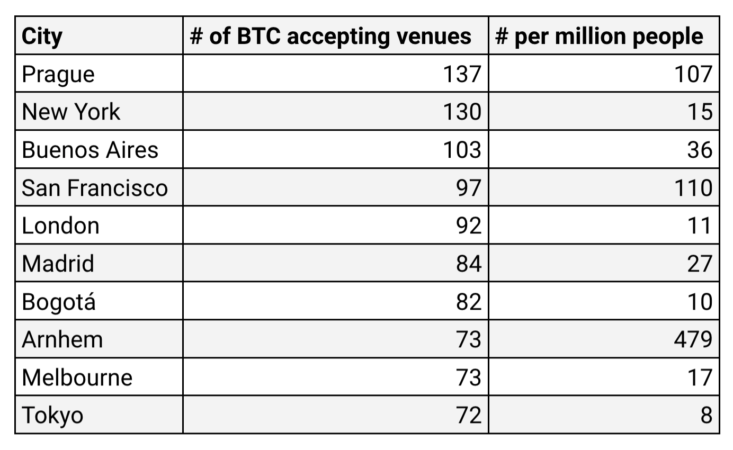 There are currently more than 13,000 bitcoin accepting venues worldwide. Out of the ones that were tagged with categories (roughly half of the total), the largest share of all venues is general shopping (35.1%) followed by ATMs (13.5%), and lodging (9.7%). 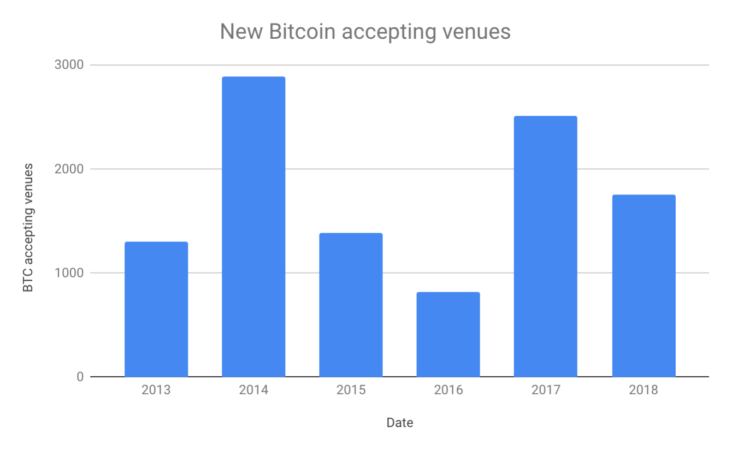 Roughly 52% of the bitcoin-accepting venues started taking the cryptocurrency between 2013 to 2015. The greatest number of new venues were added in 2014 but then, following a slowdown, activity picked up again in 2017 and 2018 (see chart). It is evident there is still interest in 2018 from both merchants and customers to accept bitcoin as payment. 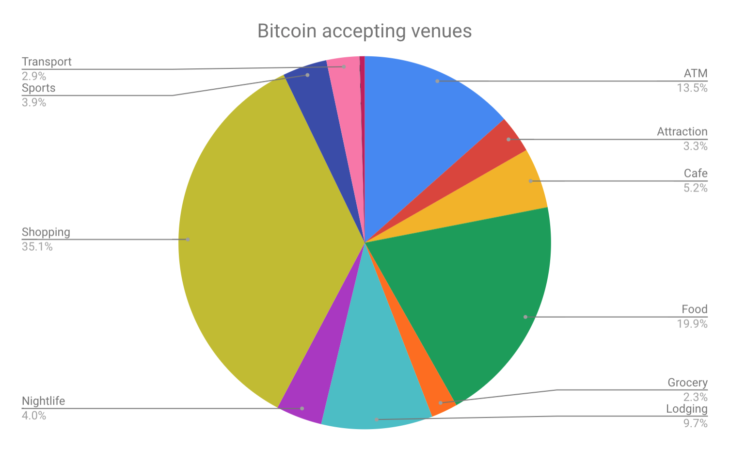 A monthly breakdown of when new venues were added shows a clear correlation between bitcoin’s volatility and the number of venues that started accepting bitcoin in that particular month. Moreover, if volatility caused by decreasing prices is discounted, the correlation is even more striking. This likely indicates that as bitcoin’s price increases, more merchants will start accepting bitcoin as payment; perhaps because an increase in price indicates larger demand and therefore a higher likelihood that someone will actually pay with bitcoin. 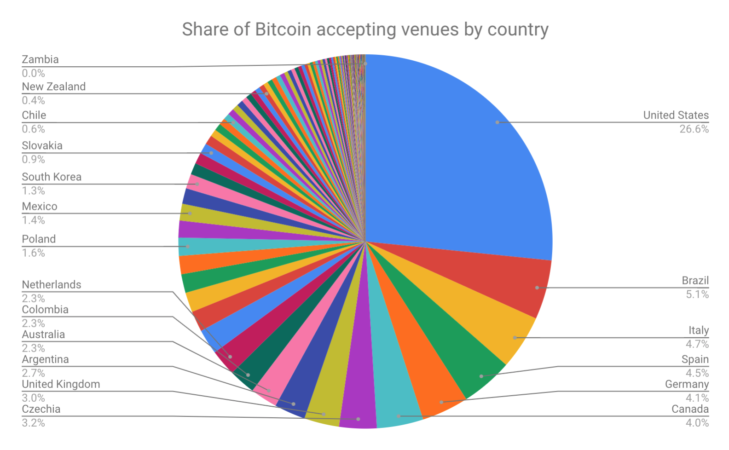 Looking at the geographical distribution, the United States is unsurprisingly leading by a wide margin with roughly 27% of all bitcoin-accepting venues. Brazil, Italy, Spain, Germany, and Canada are trailing with more than 4% each. It’s more telling, though, to weigh the results by population: The United States slides to the 21st place with 8.7 venues per one million people. 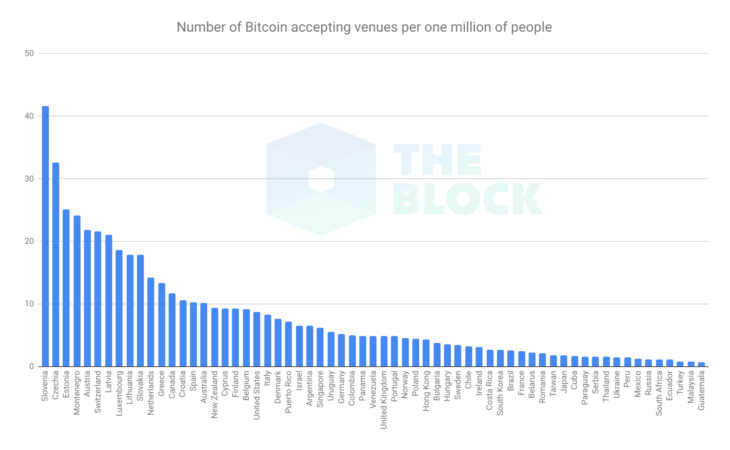 The two leading countries in bitcoin-accepting merchants per capita are Slovenia (41.6 per million people) and Czech Republic (32.6). 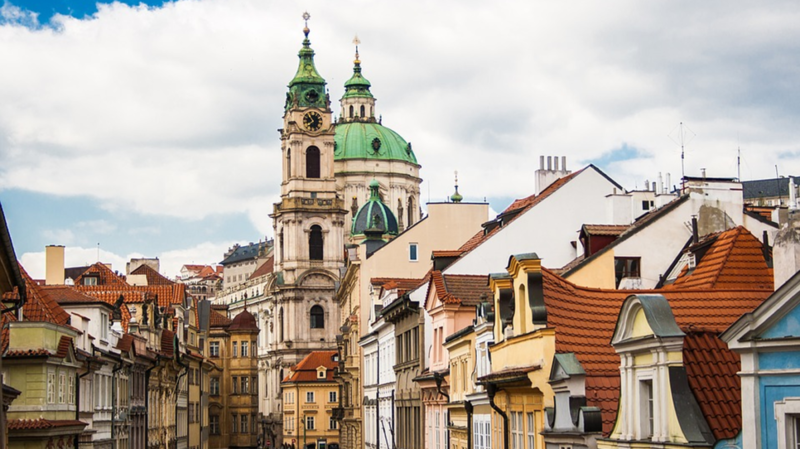 If only cities are considered, Prague, the capital city of the Czech Republic, has the highest absolute number of bitcoin-accepting venues and the third-highest density. The highest density is in the so-called “bitcoin city” Arnhem — a veritable hamlet in the Netherlands, with just 152,000 people. Even though the number of bitcoin-accepting merchants is still low and not increasing quickly, the narrative of paying with bitcoin still hasn’t died off. Whenever there is a bull market with high volatility levels, the number of new merchants that start accepting bitcoin increases. It’s unclear whether someone actually decides to pay with bitcoin — but the option is there. It will be interesting to watch whether the emergence of Lightning Network can spark interest and make bitcoin desirable for payments again.